While Labor Day in most parts of the country signals the end of summer and ushering in of fall, Labor Day in Charleston means we’re just getting our best season started. If you’re looking for a really good excuse to skip town and enjoy some time off in a place where it still feels like summer, we have three: Charleston Restaurant Week, Charleston Beer Week, and Charleston Water Week. Calling all foodies! Charleston Restaurant Week — an 11-day celebration — is one of Charleston’s most anticipated culinary events of the year. 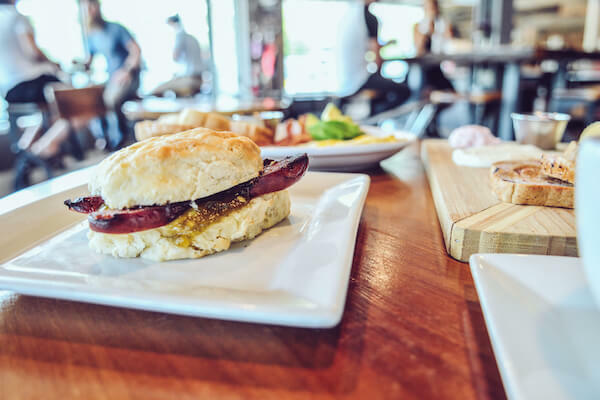 Feast on world-renowned Lowcountry cuisine at any of the long list of participating restaurants. Participating restaurants are located throughout Charleston and will offer special menu items, promotions, and discounts throughout the 11 days. We are excited to share with you that 25 participating restaurants are within walking distance to The Charleston Chestnut Mansion. So come for a stay and savor the flavors of the Lowcountry! Charleston Beer Week is a celebration of our city’s craft beer community. With a booming beer scene, Charleston is home to 24 production breweries, three brewpubs, and numerous craft beer-focused pubs, restaurants and stores. This year, Charleston Beer Week is partnering with Charleston Restaurant Week. Look for their name on the list of participating restaurants for those offering a special brew or pairing to highlight their menu. After all that wining and dining, you’ll be ready for some fun on the water. During the 8-day Charleston Water Week, you can choose from dozens of events and activities. From boating and kayaking to waterskiing and yogaboarding, there are plenty of ways for you to enjoy our gorgeous waterways. Charleston Water Week is capped off by the Kiawah Island Triathlon (there’s even a kids’ one!) and the annual 12-mile Swim Around Charleston. So while other parts of the country will be gearing up for cooler temperatures, we will still be basking in the sun and surf here in Charleston! These three events are just a few of the special events going on in September in Charleston, which are in addition to the endless entertainment we offer on a regular basis. With so much within a short distance to your stay at The Charleston Chestnut Mansion, why wouldn’t you take a little time away? *In the spirit of fall, take advantage of fallen rates when you arrive Sunday through Thursday.